Over the last decades it has been difficult to implement new waste-to-energy facilities in the US. 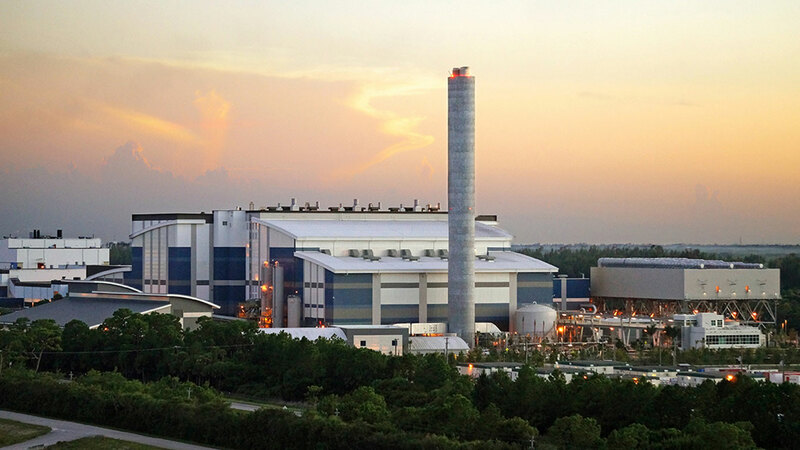 The West Palm Beach waste-to-energy plant is the first new plant in more than 15 years. In order to ensure that the facility lives up to current standards for a modern and highly advanced waste-to-energy plant, knowledge from the newest facilities across Europe has been utilised in the project. With the establishment of three large combustion units with a daily capacity of 1,000 tonne each, Ramboll has managed to lower investment costs and the carbon footprint for the facility. Furthermore, the facility is equipped with a modern spray dry absorber flue gas treatment, and is the first of its kind in the USA installed with a catalytic De-NOx system. The facility will fulfil the lowest emission limit values, and has a guaranteed electrical output above its benchmark. Throughout the planning and implementation phase, the Solid Waste Authority has invited local citizens to be involved in the process. Focusing on efficient operations and improved architecture the facility constitutes the densely populated area nicely. Besides from producing renewable energy, the facility also allows the diversion from landfills. Furthermore, the establishment of the facility has led to many new jobs in the local community. The Solid Waste Authority owns an existing RDF facility in West Palm Beach. The existing facility did not have sufficient treatment capacity and the Solid Waste Authority decided to expand the facility with a new modern waste-to-energy facility. The plant is tendered as a 20 year design-build-operate contract, won by Babcock & Wilcox in 2011, and the plant has been in operation since 2015.